Donya has been a part of our PRD Ashmore office for 5 years. She originates from a small town called Rotorua in New Zealand. 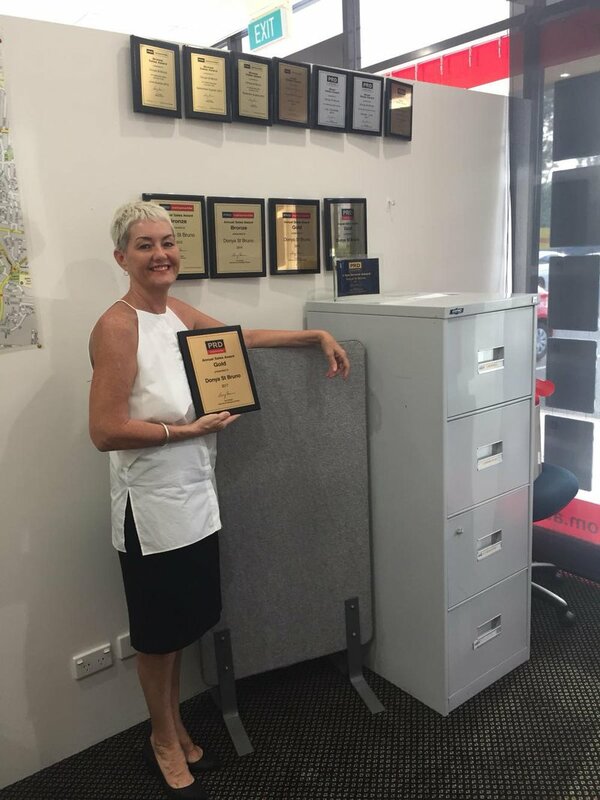 She re-located to the beautiful Gold coast in 2003 and was influenced by the Real-estate industry after buying and selling numerous property of her own over the years. Being in the shoes of both a buyer and seller throughout the sales transaction, she believed the level of services provided in the industry could be improved upon with more of a personal touch. She brings extensive knowledge and experience of real-estate and interior design to her position as a Sales Consultant. Combining her passions & influences, Donya understands all her clients on a personal level. She is recognised by her colleagues and clients alike for her professionalism, abundant energy, dedication, creativity, experience and dedication to client satisfaction. She is continuously driven and motivated by the different challenges & the pleasure of meeting a wide variety of people each day. You can always rely on Donya to remain on top of any deal in an effort to close the sale and complete the process as smoothly as possible and to the satisfaction of all parties involved. Her client’s satisfaction is of paramount Importance and their many testimonials support this. You may also know her as the “Duplex Queen”, a title earned exactly as it sounds. Not only has she achieved numerous Duplex sales in the Ashmore/Molendinar area, Donya specialises in all areas of Residential Real-estate. In her spare time you’ll catch Donya either, biking long distances along the beach, walking her dog, or cooking up a storm for her family and friends. Donya is a breath of fresh air! Her bright smile and bubbly personality makes coming to work every day that little more enjoyable. She is the Mum of the office and makes it her business to look after everyone which we love! As a salesperson, she is a gun! Super successful and highly sought after, Donya provides an honest opinion regarding property market values and provides as much information to her clients as possible to back her words. Donya is a dedicated Sales Agent with strong work ethic & vast knowledge of the sales market particularly in her specialised areas. Donya’s dealings with buyers and sellers is always a positive one with consistent repeat business as proof of this. Donya is energetic, fun and very charismatic. She works hard building positive and inspiring relationships with clients with her genuine sense of loyalty. Donya is groovy, always up with the latest trends, keeping it interesting. She is a professional business woman with great drive. She is motivated, full of energy and always knowledgeable. Always up with the latest- Donya has great marketing opinions and ideas. When it comes to marketing, Donya is always coming up with creative new and improved ideas. We are constantly blown away with her results and achievements, and we are all very proud! This is the 5th sale / purchase experience we have had with Donya. She is remarkably efficient at her job. Knowledgeable, friendly and outstanding communication. Donya has been a value creator for our portfolio of investment properties and presents perfect properties for our needs / requirements. Contactable when required and returns calls or messages promptly. Goes above and beyond if information or cominication is required. We would highly recommend using Donya's services weather it's for selling or even purchasing as a buyers agent. An Above and Beyond Agent!!! I highly recommend Donya St Bruno as an agent! She will go above and beyond for you during the sale of your home, she even looked after my cat when I was not at home. Donya is more than an agent she will become your friend and treat you the same. Donya is completely honest, trustworthy, highly efficient and has excellent communication. I knew the sale of my property was in the right hands all along. Thank you again for everything Donya. Thanks Donya for helping us with the purchase of our new house! You kept us in the loop at all times and my husband and I both feel that you were 100% honest with us through out the whole process...this is a rare find in the industry today. Thank you so much! I wouldn't hesitate to recommend you to my family and friends. Donya presents as a friendly very professional agent with excellent communication skills. She inspires confidence and trust and we highly recommend her. Dealing with Donya from the start was easy, her market knowledge was spot on, her caring and professional manor made the sale of my property effortless. I will be using her again. Donya was such a fantastic help during the purchase of our house. Being first home buyers her advice, support and friendly approach really gave us the confidence to make our dream find true. We highly recommend Donya and the PRD Nationwide Team to anyone looking to purchase a property. Emma and Daniel Stafrace. Donya St Bruno has received numerous awards over her years with PRDnationwide. The Best Ive Ever Seen! CALLING ALL BLOCK HEADS ! !